“You just complicate the narrative,” sneers one character to Bioshock Infinite protagonist Booker DeWitt. And what a narrative it is. If you strip away the first person shooter elements, the swashbuckling combat set in a city amongst the clouds, and the Bioshock series’ use of superpowers, Bioshock Infinite (Mac App Store link, GameAgent link) is still a remarkable piece of storytelling. Developed by Irrational Games and ported to the Mac by Aspyr, Bioshock Infinite explores concepts such as memory, linearity, time travel, changing history, parallel universes and the impact that our choices make—all while fighting your way through one of the most spectacular first person shooter campaigns ever. Bioshock Infinite isn’t just a worthy successor to the Bioshock series, it’s easily one of the most bizarre and exciting titles to be released this decade. Bioshock Infinite is the latest installment in the Bioshock series, and while the time period and setting have emerged from the 1950s art deco oceans to turn-of-the-century steampunk cloud cities, the game is still fundamentally a sci-fi first person shooter. You’ll be running and gunning with similar weaponry, including an assortment of guns and super powers. Instead of Bioshock’s plasmids, the powers this time are supplied by vigors that enable you to cast profoundly powerful abilities like lightning bolts, fireballs, and vengeful crows. Though your powers seem to have less intractability with the environment this time around (few moments to electrocute the water of a room, for example), the added ability for nearly every power to have a secondary tripmine mode creates some new potential tactics. Plus, unleashing a swarm of birds at your foes just never gets old. Bioshock Infinite’s plot is best kept under wraps, but the basic premise is that you’re a Pinkerton’s agent who has been sent to the floating city of Columbia to recover a girl. This girl turns out to be Elizabeth, who will accompany you for the majority of your quest. She isn’t a hapless bullet-magnet either: through her own space time-continuum manipulating abilities, she can often aid you in combat by finding useful items or opening tears to get you additional guns, helpful turrets, or new vantage points. 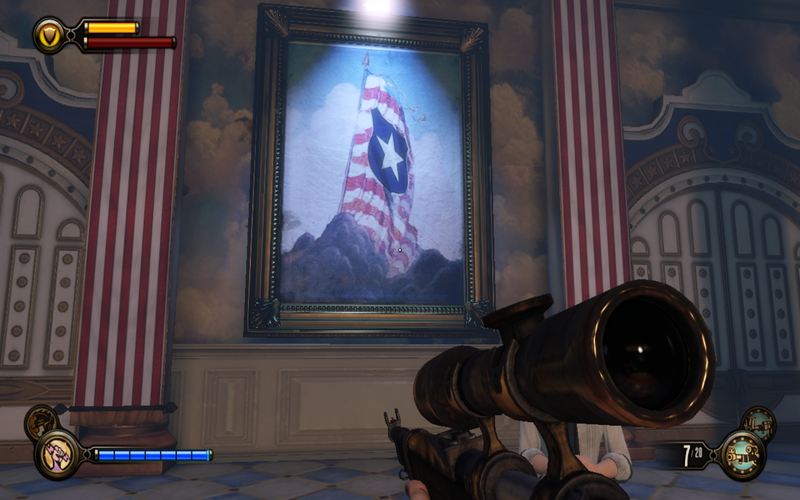 Speaking of vantage points, Bioshock Infinite takes place in an expansive city that truly feels alive from the first moment you enter it. While Rapture was notable for its death, the sense that you were treading through a ghost town, Columbia in comparison is alive with citizenry—hostile, neutral, and friendly. While this means that Bioshock Infinite sacrifices any trappings of being a survival horror game, the larger canvas allows for Irrational Games to paint a much more epic picture, with huge vistas and large firefights that the previous games could never achieve. You’ll pick off enemies with a sniper rifle from across a rooftop and then hop on one of the Skyline tracks to swing around and onto a passing airship. The combat is frenetic, multi-level, and delightfully varied. The ideas explored are also diverse and at times, emotionally taxing. The city founders’ white supremacist, Prophet-focused brand of Christianity (which has drawn some uncomfortable comparisons to certain modern religious groups) takes center stage, exploring turn-of-the-century ideas of isolationism and racial purity in the same way that Bioshock took on Randian philosophies of extreme selfishness and free-market capitalism. But Infinite also features a revolutionary group in the Vox Populi, a popular uprising led by the underclasses of the city who have their own moral failings. Booker and Elizabeth are caught between these warring factions, trying to navigate a revolution and stay alive with the plot moving along briskly. But this isn’t always to the game’s benefit. Revelations can sometimes come one after the other without Booker or Elizabeth spending enough time to process them. In one moment, Elizabeth will be in tears after a particular revelation and in the next she’s almost perky about finding you some ammo to kill some more people. Still, there are enough moments—like finding a Jewish tailor’s stand defaced with bigoted graffiti, or the first eerie moments in the city’s baptism chamber—that the game truly reveals how strange a place Columbia is...in many ways worse than Rapture. Fans of the Bioshock series have come to appreciate Irrational Games’ focus on story, use of super powers, and imaginative worlds. But the average FPS fan will likely find Bioshock Infinite’s gunplay elements to be soft, the campaign linear with too much item hunting, and the multiplayer nonexistent. Enemies vary from gun-wielding soldiers to giant armored Handymen and fireball-throwing Firemen, but their tactics are simplistic and predictable. Similar, switching between melee, firearm, and vigor combat techniques never feels as smooth as you’d like, but this is nothing new to the Bioshock series. Bioshock Infinite and its predecessors are about providing a different kind of experience, and with its complicated approach to narrative and its use of Columbia as one of the best playgrounds you could imagine, Bioshock Infinite succeeds in creating a gaming experience unlike any other. Seasoned fans of the series or those taking the plunge for the first time owe themselves an opportunity to play this bizarre, wonderful game. 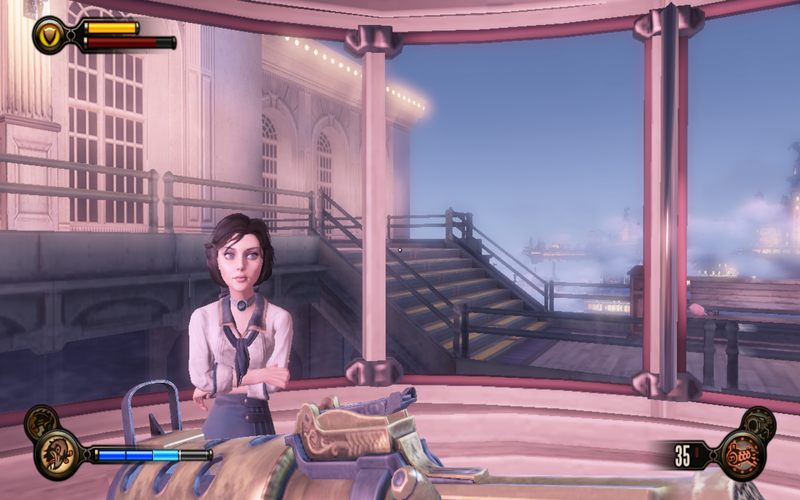 Bioshock Infinite is bizarre and wonderful—a must-have for any Mac gamer.